While some Lafayette Democrats seek out ways to rollover to local Republicans, a Shreveport Democrat is waging a spirited, if lonely, fight to overturn the recent re-election of Republican Jim McCrery to the congressional seat from Louisiana's Fourth District. Patti Cox was one of two Democrats who challenged McCrery in the November 7 election. Artis Cash was the other. Mr. Cash got the endorsement of the state party when Ms. Cash didn't attend the state party endorsement convention shortly before the election. McCrery was re-elected with about 57 percent of the vote. Cash took about 17 percent of the vote; Cox 13. A second Republican took the rest of the vote. Cox has filed suit in state court in Shreveport seeking to have McCrery disqualified based on the fact that he does not live in Louisiana and provided false information to the Louisiana Secretary of State when he (or members of his staff) filed qualifying papers. She is also seeking to have the next two top vote getters (she and Mr. Cash) inserted into the December 9 runoff election. McCrery responded by seeking a transfer of the case to federal court. Patti believes this is an attempt to stall on the case until it is too late to get the remedy she seeks: a run-off with McCrery not on the ballot. The case has been transferred to federal court but Patti is also seeking to have the case returned to state court. After the election, when it became clear that Democrats had won control of the U.S. House of Representatives, there was speculation in media in Shreveport that McCrery might not take his seat in the House. He was in line to become chairman of the Ways & Means Committee had Republicans retained their majority status in the House. McCrery has been rumored to have been offered several lucrative lobbying positions (at least one being with a firm where former Democratic Senator John Breaux works). The nub of Cox's suit is that McCrery does not have a residence in Louisiana and, so, cannot be elected to Congress from Louisiana. Here is the case made against McCrery in the original state court filing which Patti provided me after I called her about the case. 1. Defendant, who sold his residence at 10815 Longfellow Trace, Shreveport, LA 71106, located in Southern Trace Subdivision of Shreveport, LA, on June 3, 2004, was not an inhabitant of Louisiana (Exhibit A), when elected for Congress for Louisiana's 4th Congressional District on November 7, 2006, as required by R.S. 18:1275 B and U.S.C.A. Const. Art 1ß2. Cl.2 (Exhibit B). Defendant admitted to not living in the area the night of the election on TV. The guard at the entrance of Southern Trace said Defendant has not lived in Southern Trace for a year and a half. 2. Defendant deceptively listed P.O. Box 52956, Shreveport, LA 71135, and 10855 Longfellow Trace, Shreveport, LA 71106 (Exhibit C), as his residence when filing to run for Congress on August 9, 2006, with the Louisiana Secretary of State on a sworn statement before a notary. The 10855 Longfellow Trace information was given by the Secretary of State's Office, 8549 United Plaza Blvd., Baton Rouge, LA 70804 (225-922- 0900), and the Registrar of Voters Office, 525 Marshall Street, Shreveport, LA (318-226- 6891). 3. Qualifications of Members of Congress make being an inhabitant of that state in which he shall be chosen a condition at the time of the election. Qualifications are defined and fixed in the U.S. Constitution and are unalterable by the legislature. Exclusion can only be exercised when a Member-elect fails to meet a qualification expressly prescribed in the Constitution. As is par for the course, Patti has undertaken this case on her own, with no help from the party on any level, thus far. In a phone conversation on Tuesday, Patti indicated that there has been some attempted contact from the Democratic National Committee, but nothing has materialized thus far. Patti Cox's campaign website declared her to be a candidate for the seat in Louisiana's "Fighting Fourth." She's helping Democrats in the district live up to that title. How refreshing that is! If anyone wants to know what's wrong with the Democratic Party in Lafayette, look no further than this article in the Baton Rouge Advocate. Glenn Armentor is a member of the parish Democratic Executive Committee but is hosting a fund-raising party for Republican Joey Durel. Glenn Armentor is a great attorney, a great guy and, generally, a good Democrat (he supported my campaign for Congress and I'm grateful for that support). But, he should resign his position on the parish Democratic Executive Committee because of this public display of support for Durel. This is the kind of lemming-like behavior that has come to characterize the leadership of the party here. Joey Durel is a decent mayor; but he's no visionary. The fiber to the home project was on the table when he took office. Durel and his legal team have managed to botch that project to the extent that, 18 months after the referendum on the it, all we have to show for it are legal bills. Durel also failed to show leadership on the single most troubling issue in Lafayette (and the one that most hobbles our effort to emerge as a progressive city): race. His silence on the issue of renaming a major street after Dr. Martin Luther King contributed significantly to allowing this issue to become a political abscess that causes a low-grade fever to plague our community. His failure to lead on that issue was every bit as bad as his leadership in selling the fiber project was good. Durel also went through the motions of suggesting taxes for new roads here, but didn't make any effort to get the taxes passed. If he didn't believe they were needed, why propose them? If he felt they were needed, why didn't he work for them? Yet, there is a leader of the local party gushing about Durel as if he's the local incarnation of Harry Truman. Armentor has fallen into the Republican trap that exists in Lafayette. 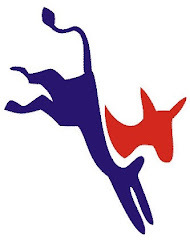 Democrats are asked to "vote for the person, not the party" but can Armentor or any other Democrat point to a single example of where Lafayette Republicans have taken a similar approach in any race? If Glenn Armentor wants to back Joey Durel's re-election, that's his right as a citizen. But, he should not do it while sitting as a member of the parish Democratic Executive Committee. The responsibilities of that position include building the party. By publicly supporting Durel, Armentor is working against the interests of the party. There will be no victory or defeat for the United States in Iraq. These terms do not reflect the reality of what is going to happen there. The future of Iraq was always going to be determined by the Iraqis -- not the Americans. Iraq is not a prize to be won or lost. It is part of the ongoing global struggle against instability, brutality, intolerance, extremism and terrorism. There will be no military victory or military solution for Iraq. Former secretary of state Henry Kissinger made this point last weekend. The United States must begin planning for a phased troop withdrawal from Iraq. The cost of combat in Iraq in terms of American lives, dollars and world standing has been devastating. We've already spent more than $300 billion there to prosecute an almost four-year-old war and are still spending $8 billion per month. The United States has spent more than $500 billion on our wars in Iraq and Afghanistan. And our effort in Afghanistan continues to deteriorate, partly because we took our focus off the real terrorist threat, which was there, and not in Iraq. We are destroying our force structure, which took 30 years to build. We've been funding this war dishonestly, mainly through supplemental appropriations, which minimizes responsible congressional oversight and allows the administration to duck tough questions in defending its policies. Congress has abdicated its oversight responsibility in the past four years. It is not too late. The United States can still extricate itself honorably from an impending disaster in Iraq. The Baker-Hamilton commission gives the president a new opportunity to form a bipartisan consensus to get out of Iraq. If the president fails to build a bipartisan foundation for an exit strategy, America will pay a high price for this blunder -- one that we will have difficulty recovering from in the years ahead. To squander this moment would be to squander future possibilities for the Middle East and the world. That is what is at stake over the next few months. Senator Hagel, a Vietnam combat veteran, has consistently been willing to state publicly what many others in Washington will only say in private: Iraq has been a disaster for this country. What Senator Hagel refers to as "leaving Iraq with honor" is really trying to find a way to allow the Bush administration to save face when it does come around to withdrawing from Iraq. It will be interesting to see if the coming withdrawal will be one of our choosing, or one events force on us as supply lines are cut off and our overstretched military has to fight its way out of that country (this is viewed as a real possibility by some military leaders who have been watching developments there). Meanwhile, unless and until the President can find the moral and ethical strength he has yet to display at any point in his life (in the form of admitting a mistake), more American military service men and women will die for nothing more than his ego. This war of his choosing was a mistake that has turned into a military, foreign policy and moral debacle for our country. Eventually, I'm sure, Charles Boustany will take a public position on the war, too. When that day comes, the position will be one guaranteed not to offend his Republican patrons. As of today, 64 Louisianians have died in this war. How many more will have to die before Charles Boustany finds the courage of his convictions? The New York Times has an article today about how the pharmaceutical industry is reacting to the results of the November 7 election. But, their lead lobbyist is former Louisiana Congressman Billy Tauzin and Tauzin is out there hustling to justify his $2.5 million annual salary by trying to block passage of legislation which would allow the federal government to rein in the pharmaceutical gravy train that is also known as the Medicare Prescription Drug Program (or Medicare Part D). Failing that, Tauzin wants President Bush to veto any such legislation that makes its way out of the Democratic-controlled Congress next year. Hoping to prevent Congress from letting the government negotiate lower drug prices for millions of older Americans on Medicare, the pharmaceutical companies have been recruiting Democratic lobbyists, lining up allies in the Bush administration and Congress, and renewing ties with organizations of patients who depend on brand-name drugs. Many drug company lobbyists concede that the House is likely to pass a bill intended to drive down drug prices, but they are determined to block such legislation in the Senate. If that strategy fails, they are counting on President Bush to veto any bill that passes. With 49 Republicans in the Senate next year, the industry is confident that it can round up the 34 votes normally needed to uphold a veto. While that showdown is a long way off, the drug companies are not wasting time. They began developing strategy last week at a meeting of the board of the Pharmaceutical Research and Manufacturers of America. Billy Tauzin, president of that group, a lobbying organization for brand-name drug companies, recently urged Representative Edolphus Towns, Democrat of New York, to seek a position as chairman of a powerful House subcommittee, said Karen Johnson, a spokeswoman for Mr. Towns. The subcommittee has authority over Medicare and the Food and Drug Administration. Ah, yes! Hurled out of control of Congress by an electorate that had grown tired of the corruption and the favoritism shown special interest groups over the needs of citizens, one of the richest special interest groups in the country is gearing up to protect their plunder. Tauzin, is must be noted, got his job in exchange for writing in the provision that prevents the federal government from negotiating over the price of drugs covered by the Medicare Part D program. That wasn't corruption; that was the K Street Project in operation. 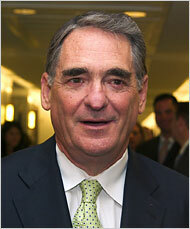 Note, too, that former Tauzin spokesman Ken Johnson is now a vice president of PHARMA. Guess it was a package deal offered by a grateful industry? Tauzin, ever the hypocrite, says he's only defending the interests of beneficiaries, many of whom are happy with the program. Well, no doubt they are happy, but they would be a damned site happier if the costs of the drugs were lower, particularly once they cross-over into the 'doughnut' part of the program where all drug expenses come out of the pockets of seniors. As a read of the article indicates, the outcome is far from certain, owing in no small measure to the influence (read that "campaign dollars") the pharmaceutical industry packs in Washington. The real test for Democrats on this effort to reform Medicare Part D will really come down to whether they are serious about ethics reform or not. If the pharmaceutical industry (and people like Billy Tauzin) can prevail in fighting off this reform, then it will be a clear signal of the need for radical surgery on lobbying and campaign finance reform. It will also indicate that the new Democratic Congress might well have a short stay in the majority. The Republican leadership of the 109th Congress has moved to take permanent right to the title of "The Do Nothing Congress." There's also no guarantee that Republicans will pass a multibillion-dollar measure to prevent a cut in fees to doctors treating Medicare patients. The decision to drop so much unfinished work in Democrats' laps demonstrates both division within Republicans ranks and the difficulty in resolving so many knotty questions in so short a time. GOP leaders promised their House and Senate members the December lame duck session would last no more than two weeks, or until Dec. 16 at the latest. Now, with the agenda shrinking, a session that will be the last for 45 retiring or defeated House members and senators should be wrapped up by Dec. 8. Now, this is the same group that spent fewer than 100 days in session during this election year, setting something of a record on that. The hypocrisy of these folks would be astounding if only it weren't their standard operating procedure! These are the people who changed the Welfare Reform law to no allow education count towards work requirements while at the same time refused to increase the minimum wage for over a decade (until they tried to link an increase to yet another tax cut for the rich). There used to be a saying that "there's no free lunch in America." Maybe not, but the closest thing to it is to be a Republican member of Congress where you just have to allow lobbyists to write legislation and get the occasional earmark in order to live the plush life in Washington. This is but the latest evidence that Republicans are unfit to lead. Tonight we bring you the election recap show with Tommy Guilbeau and Anthony Fazzio. First up, the SPANKING Joey Durel got on the "Durel Sales Tax Increase" and then we go into the new US Congressional Make up. Just before the election, the Bush administration went to court to fight the release of any details about the, uh, coercive techniques the CIA (and probably private contractors) have been using on alleged terror suspects. I refer to them as alleged because the entire process of determining the guilt or innocence of these people is beyond the reach of the courts. In fact, in testimony before the Congress during the summer, a spokesman for the Justice Department admitted that the standard the Bush administration wants to apply to so-called "foreign combatants" is not a standard of justice this country would find acceptable if applied to captured U.S. military. A story in Friday's Washington Post makes clear just how far outside the norms of convention the Bush administration has pushed the CIA, contractors and military interrogators. The story details the ordeal of an Islamic cleric kidnapped from the streets of Milan with the complicity (if not the overt help of Italian intelligence officials) in 2003. The kidnapping itself remains the focus of an Italian investigation, with more than 20 U.S. CIA agents subpoenaed for questioning. MILAN, Nov. 9 -- In an account smuggled out of prison, a radical Muslim cleric has detailed how he was kidnapped by the CIA from this northern Italian city and flown to Cairo, where he was tortured for months with electric shocks and shackled to an iron rack known as "the Bride." The document has been submitted as evidence to defense attorneys representing 25 CIA officers, a U.S. Air Force officer and nine Italian agents who have been charged with organizing the kidnapping of Nasr, an Egyptian national, in February 2003. A copy of the document, handwritten in Arabic, was obtained by The Washington Post. Undated, it reads like a homemade legal affidavit, outlining how Nasr was seized as he was walking to a mosque in Milan, stuffed into a van and rushed to Egypt in a covert operation involving spies from three countries. "I didn't understand anything about what was going on," Nasr wrote. "They began to punch me in the stomach and all over my body. They wrapped my entire head and face with wide tape, and cut holes over my nose and face so I could breathe." Upon his arrival in Egypt hours later, he said, he was taken into a room by an Egyptian security official who told him that "two pashas" wanted to speak with him. "Only one spoke, an Egyptian," he recalled. "And all he said was, 'Do you want to collaborate with us?' " Nasr said the other "pasha" appeared to be an American. His captors offered a deal: They would allow him to return to Italy if he agreed to become an informant. Nasr said he refused. As a result, he said, he was interrogated and physically abused for the next 14 months in two Cairo prisons. Italian prosecutors charge that the CIA and the Italian military intelligence agency known as Sismi collaborated to kidnap Nasr, who was known for preaching radical sermons in Milan and railing against U.S. policies in Afghanistan and the Middle East. According to prosecutors, the abduction thwarted a separate Italian police investigation into Nasr's activities and jeopardized a surveillance operation concerning other radicals in Milan. Court papers allege that the kidnapping was orchestrated by the CIA's station chief in Rome and involved at least two dozen CIA operatives, most of whom arrived in Italy months before to lay the groundwork. Italian judges have issued arrest warrants for the CIA officers and have pledged to try them in absentia if necessary. Although the case has caused a furor in Italy, the U.S. government has neither confirmed nor denied playing a role in Nasr's disappearance. Egyptian officials have also remained silent. A CIA spokesman declined to comment for this story. Nasr's wife and his lawyer in Cairo have said the cleric is still imprisoned in Egypt, although he has been released under house arrest for brief periods. It is unclear how Italian prosecutors received a copy of his letter. Investigators said handwriting experts have verified that Nasr was the author. Prosecutors in Milan are also investigating allegations that Italian spies offered to give Nasr $2.5 million if he would sign papers saying he had left Italy voluntarily and was not kidnapped, according to Italian news reports. In his letter, Nasr described how his health had badly deteriorated. He had lost hearing in one ear from repeated beatings, he said, and his formerly pitch-black hair had turned all white. He said he was kept in a cell with no toilet and no lights, where "roaches and rats walked across my body." He also gave a graphic account of Egyptian interrogation practices, including how he would be strapped to an iron rack nicknamed "the Bride" and zapped with electric stun guns. On other occasions, he wrote, he was tied to a wet mattress on the floor. While one interrogator sat on a wooden chair perched on the prisoner's shoulders, another interrogator would flip a switch, sending jolts of electricity into the mattress coils. About the only thing in worse shape than the U.S. military (which is pinned down in Iraq) is the reputation of this country in the world. Ronald Reagan's image of America as "the shining city on a hill" has been replaced by the image of a hooded, manacled man standing on a box in Abu Grahib Prison. That second image may be becoming outdated. It seems that a person being beaten by 'rent-a-torturer' goons from places like Egypt at the behest of American kidnappers is likely the emerging current image the Bush administration has created for our country. The human carnage of the war and occupation of Iraq (as gut-wrenching as they are) pale in comparison to the damage done to this country's ability to act as a standard bearer for human decency and the rule of law. Bush and Cheney have done a heck of a job on this score. Here is an Election Day Video WORTH watching! Click PLAY Below! If you guys watched my show I went into detail and included part of the interview with Ken Mehlman - head of the RNC - trying to defend the racial and smutty ad he paid for against Harrold Ford in Tennessee. Well this young group of folks, put together their own response. Check it out, you will love it.